You manage a variety of services to maintain numerous systems for your properties. Lighting, HVAC, plumbing, and roofing often demand most of your focus because, quite naturally, your customers can’t enjoy their shopping or dining experience if they can’t see or if there are leaks in the ceiling. But shouldn’t the vast area of asphalt right in front of your properties get your attention too? A parking area is the welcome mat of any site; the one feature that can instantly show a customer you care about the details. Unfortunately, a parking lot is often overlooked until a liability issue brings it to your attention. The best way to project a positive image and avoid common liability pitfalls is to plan ahead. And the best way to plan ahead is to develop a pavement maintenance plan, or PMP, which takes a big-picture, long-term approach to managing asphalt. The most effective plan is one that utilizes the right products and application processes. This paper takes an objective look at various site-specific factors that determine which products should be used and how they should be applied. Armed with this knowledge, you will be better equipped to discuss PMP with your preferred contractor and specify the right products and processes to get what you pay for and, more importantly, improve overall pavement performance and longevity. Preventative pavement maintenance begins with an assessment of your properties. Some defects are beyond the scope of a maintenance program and require a higher degree of repairs (with funding from a capital budget). Walk your lots with a reputable paving contractor or engineering firm and take note of defects. Alligatored pavement, depressions and sinkholes, October 2015 THE RIGHT PRODUCTS AND PROCESS EXTEND PAVEMENT LIFESPAN Written by: Harry Carter – General Manager, Mid-South Region, GemSeal Pavement Products ponding, rutting, damaged catch basins, and extensive potholes are problems that require varying degrees of structural remedies. Asphalt with cracks, oil stains, and a gray or raveling surface (one in which the stones have begun to come loose from the black asphalt binder) can usually be addressed by a maintenance program. Assessing the pavement across your portfolio can help you select the right product or service to address a specific problem. For example, a maintenance program will not fix a capital problem. That is because a maintenance program is not a structural remedy for pavement defects; it cannot prevent cracking caused by poor design, improper construction, or fatigue. It cannot restore a worn out pavement or cure defects in the base, sub-base, or mix design of the asphalt. And it cannot remedy poor placement or lousy workmanship. Simply put, pavement maintenance products help to extend the life of asphalt pavements that are in good condition compared with those left exposed to environmental elements and petroleum fluids. A good PMP consists of three primary maintenance procedures: crack sealing, sealcoating, and lot marking. When the right products are properly applied and each service is performed routinely, pavement usability and lifespan are extended. In fact, a regular maintenance plan can double the life of the asphalt and enable you to defer costly resurfacing. That means better cash flow for your business. Without proper application, you will be throwing your money away. With proper application, you will get the results you pay for. Ensure proper application by hiring an experienced, reputable contractor and giving them a specification to follow. The specification ensures the contractor adequately prepares the surfaces to be maintained, uses the right materials (the ones you select for your properties, with advice from your material supplier), applies them under the proper weather and temperature conditions, and follows adequate safety procedures to minimize job-site risk. A specification can also enable you to obtain multiple bids from contractors on an apples-to-apples basis, since it will outline how the work is to be performed. In short, a specification is a recipe for success on a job! With large changes in air temperature, asphalt can move and crack. Crack sealing is the first step in a well designed PMP. It prevents surface water from seeping through cracks into the underlying base. Once water begins to enter the base, it can wear away stones and create voids which can lead to potholes, ruts, and other serious repairs. Water entering into the sub-base can also create freeze-thaw problems. Crack sealing also helps prevent the introduction of in compressible objects into cracks. These objects will not compress as the crack contracts in warm weather, cracking and breaking the asphalt along the edge of the joint. Your next big decision is choice of materials. Materials should be specific to an area’s climate as well as the amount of traffic the site incurs. Based on their ease of use and cost-effectiveness (i.e. they can be applied quickly over a large parking area), most contractors will recommend and use hot-applied crack sealants. Also called hot-pour, these asphalt-based sealants are heated to a liquid state at temperatures up to 400°F. When heated, they flow like water into the cracks and then harden as they return to ambient temperature. Performance of crack sealants in different climates depends greatly on their softening point, which is the temperature at which the crack sealant begins to deform under pressure and becomes sticky or tacky. Crack sealants have been engineered to perform in specific temperature ranges, so work with a materials supplier to get the right products on your parking lots. For example, a higher softening point reduces sticking or tracking in hotter regions, while a crack sealer with a lower softening point would likely be adequate in colder climates. There are two different types of hot-pour crack sealants: direct fire sealants, in which heat is applied directly to the sealant in direct fire kettles, and oil-jacketed sealants, in which heat is indirectly transferred from hot oil to melt the sealant in an oil-jacketed melter. Generally, an oil-jacketed melter provides better heat control (and less chance of burning or scorching the sealant) and is preferred for larger applications. Of equal importance with material selection is proper installation of the crack sealant. Prior to installation, insist that cracks be routed to at least ½” in width and ¾” in depth. Routing opens small, random cracks and allows for better performance of the sealant by producing uniform edges on the cracks, a deeper reservoir for the liquid sealer to fill, and a better sidewall to enhance adhesion of the sealant. Routing random cracks prior to installation provides a 40% greater chance of sealant success! After routing, be sure that the contractor blows debris out of the crack and uses a heat lance as needed to eliminate bond-destroying moisture. Finally, ensure that your specification spells out application conditions. Your contractor should apply the sealant in accordance with the manufacturer’s recommended temperature range, which is typically in air and pavement temperatures above 45°F. 2 3 You manage a variety of services to maintain numerous systems for your properties. Lighting, HVAC, plumbing, and roofing often demand most of your focus because, quite naturally, your customers can’t enjoy their shopping or dining experience if they can’t see or if there are leaks in the ceiling. But shouldn’t the vast area of asphalt right in front of your properties get your attention too? A parking area is the welcome mat of any site; the one feature that can instantly show a customer you care about the details. Unfortunately, a parking lot is often overlooked until a liability issue brings it to your attention. The best way to project a positive image and avoid common liability pitfalls is to plan ahead. And the best way to plan ahead is to develop a pavement maintenance plan, or PMP, which takes a big-picture, long term approach to managing asphalt. The most effective plan is one that utilizes the right products and application processes. This paper takes an objective look at various site-specific factors that determine which products should be used and how they should be applied. Armed with this knowledge, you will be better equipped to discuss PMP with your preferred contractor and specify the right products and processes to get what you pay for and, more importantly, improve overall pavement performance and longevity. Sealcoating provides a protective barrier against UV rays, water, and salt; some sealers also protect against oils and gasoline. A sealer locks in the components of the asphalt pavement, namely the fines, binder, and stones, to help hold it together. It also helps to keep asphalt pavement flexible by sealing in the asphaltic oils. After new construction or resurfacing, it is advisable to wait one year before applying sealer. Thereafter, sealer should be reapplied approximately every 24 to 48 months, depending on the sealer used on the job. Most manufacturers make various types of pavement sealer, both refined tar and asphalt based, and each type can be polymer modified or non-modified. Refined tar sealer is the most commonly used in markets east of the Rockies. Refined tar, in contrast to asphalt, is slower to oxidize, which gives it a distinct advantage in longer-lasting protection against the elements (water, UV sunlight, air) and resistance to fading when compared to its asphalt-based cousin. Refined tar is also resistant to petroleum fluids (gasoline, diesel, motor, and transmission oil), which readily soften and dissolve the asphalt that glues together stones in the pavement. However, the economic availability of refined tar is limited to the eastern and Midwest US because refined tar production is confined to five producers located in the eastern US and southeastern Canada. For logistical reasons, this makes refined tar sealer too costly to produce in or deliver to western states. In contrast, asphalt bitumen – used to make asphalt-based sealers – is widely available across the US, which makes asphalt-based sealer available throughout the country. Though not fuel resistant or as durable as refined tar, asphalt-based sealers provide protection in a similar way that adds value by extending the service life of asphalt pavements. means fewer disruptions. It also lowers annualized maintenance cost over the life of the pavement. A final word about refined tar sealers: these effective sealers have come under pressure from some environmental groups – despite a growing body of science which supports their safe use – and in some places have been banned from use. On the other hand, asphalt emulsion and other non-refined tar sealers are suitable for use nationwide. Your chosen material manufacturer or contractor can answer any questions you may have about this issue. Also be sure to ask your contractor about additives. The climate in which your sites are located can also help dictate the use of additives to enhance adhesion (bonding to pavement), cohesion (strength of the film), and viscosity (thickness) within the sealer. In wet climates, sealer additives can help quicken drying and cure time, improve color, reduce tracking, and strengthen the cured film. Sand should also be added to increase traction. As with crack sealers, the right application conditions enable you to get great results with pavement sealers. On the day of the job, the pavement and ambient air temperature should be at a minimum of 50°F (and rising) and a maximum of 95°F. There should be no rain, fog, or frost for 24 hours prior to and after application. Prior to application and for best results, the surface should be power washed and blown or swept. Any oil or gas spots should be pre-treated. And, oxidized surfaces should be primed. Sealer can be applied using two methods: squeegee or spray. Squeegee is an easier, yet slower process than spray application. With this method, the material is not under pressure and is not affected by wind. When applied (using a broom, brush, rubber squeegee, or machine), it fills voids in the pavement. But, it can be more difficult to control the application rate and squeegee marks may appear if not properly spread. In contrast, the spray method applies sealer evenly over the entire surface. It is easy to control material yield and there are no squeegee marks. But, it is not recommended for windy conditions. With either method, uniform coverage is critical, and the first coat must dry completely before a second coat is applied in the opposite direction. 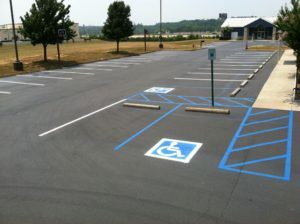 One common mistake property owners make is opening the parking lot too soon after sealcoating. Sealer can be dry-to-the-touch in minutes. But, that doesn’t mean it is ready for traffic! A newly applied, dry-to-the-touch coating can tear or re-absorb water if rain or sprinkler precipitation or car tires are introduced too soon after application. That is why it is very important to disengage sprinkler systems and keep traffic off a newly sealed surface for a minimum of 24 hours. The complete curing process, when water has fully evaporated from the coating and a hard film has formed, can take as long as three weeks to one month. It is normal to see some minor wheel scarring for a week or two after job completion, especially in the hotter part of the day. But this condition will decrease with each passing day until the coating reaches final cure. The finishing touch to any parking lot is clearly marked striping. This procedure is critical to direct people and traffic safely around the property. After the initial application, restriping should occur every two to three years. This time-frame may vary depending on the amount of sun exposure, traffic load, or snow plow damage the site has endured, all of which contribute to fading or otherwise compromising paint lines. For striping over new asphalt or fresh sealer, use a fast-dry latex acrylic, which is water based. An acetone acrylic paint, which is solvent based, may be used for better performance and longer-lasting lines. This is because solvent-based acrylic has a much harder resin after curing for improved resistance to abrasion over time. Crosswalks should be painted using a durable, single-component paint formula containing chlorinated rubber alkyd or acetone acrylic. When re-striping, solvent-based paints, alkyd, chlorinated rubber, and acetone acrylic paints work better on top of existing lines which are typically latex water based. Re-striping existing latex lines with latex paint normally causes bonding problems. Solvent and water-based paints can be applied with airless and air-pressurized paint machines to create crisp, professional lines Be sure to ask your contractor to use a paint that complies with local air quality laws, which can vary from region-to-region and from state-to-state. All paints types are available in low-VOC formulas to comply with air quality laws in all 50 states. This entry was posted in Uncategorized and tagged Asphalt Sealer, black diamond, driveway sealers, gemseal, pavement maintenance, sealcoating rochester ny, sealcoating supplies rochester ny. Bookmark the permalink.